Description: The body may be white or yellow in colour. 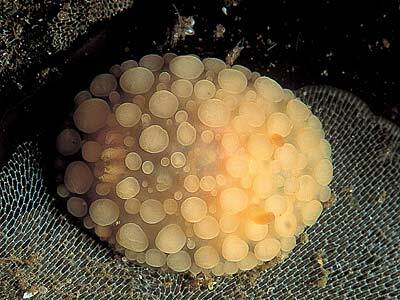 The mantle is covered by rounded tubercles which are very variable in size. 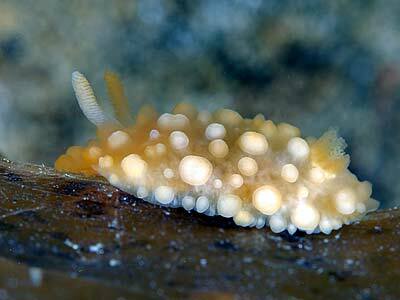 The rhinophores are lamellate. Up to 32mm in length. Habitat: Kelp forests in shallow water. 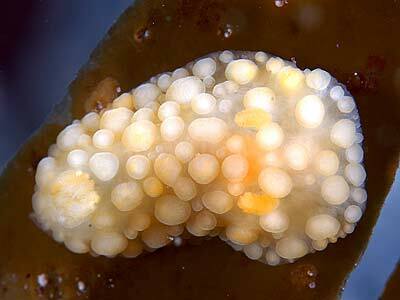 Ecology: Appears to feed on Membranipora membranacea on kelp fronds. Distribution: The original description gives the locality of the type specimen as Bantry Bay, SW Ireland, but this may be a mix-up of the original material by Alder & Hancock. Currently this species seems to be confined to Norway and Sweden. Alder & Hancock mention material received from Lovén and name the animal after him. The specimens reported from W. Scotland by Thompson & Brown are probably large Adalaria proxima. Similar Species: Similar in appearance to Adalaria proxima but with larger flattened tubercles. Picton, B.E. & Morrow, C.C. (2016). Adalaria loveni (Alder & Hancock, 1862). [In] Encyclopedia of Marine Life of Britain and Ireland.